Background: Glyoxalase-I (Glo-I) enzyme is an attractive new target for developing new cancer therapeutics. This enzyme is a dimeric mononuclear zinc coordinating metalloenzyme, and the core zinc ion was utilized in designing potentially active inhibitors possessing a selective zinc binding feature. 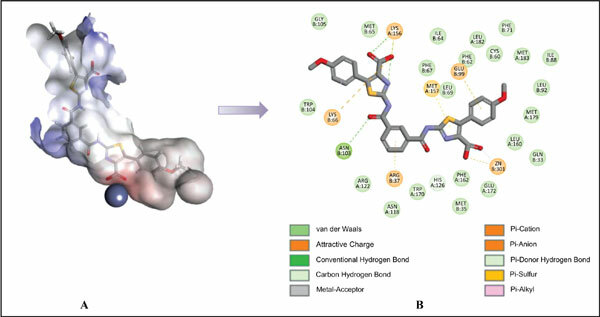 Objective: A panel of thiazole based carboxylic acid derivatives were designed, synthesized, and evaluated for their in vitro inhibitory activity against Glo-I enzyme based on their chelating potential with the zinc atom at the core of the active site. Methods: Flexible molecular docking was employed in designing the proposed inhibitors. The designed compounds were synthesized, fully characterized, and in vitro assayed against Glo-I enzyme. Results: Compound 14 was identified as the most potent inhibitor of the series with an IC50 of 2.5 µM. Moreover, the in-silico calculated CDocker scores were in excellent agreement with the experimental inhibitory activity of the compounds. Conclusion: The carboxylic acid group was identified as an indispensable chelating functionality in inhibiting Glo-I enzyme. The data obtained in this study indicate that these compounds could be promising anti-cancer candidates and hence warrant further optimization. Keywords: Computer aided drug design, glyoxalase-I, thiazole carboxylic acid, zinc binding feature, CDocker, anticancer. Keywords:Computer aided drug design, glyoxalase-I, thiazole carboxylic acid, zinc binding feature, CDocker, anticancer. Abstract:Background: Glyoxalase-I (Glo-I) enzyme is an attractive new target for developing new cancer therapeutics. This enzyme is a dimeric mononuclear zinc coordinating metalloenzyme, and the core zinc ion was utilized in designing potentially active inhibitors possessing a selective zinc binding feature.